Dubai: The Consulate General of The Netherlands opened its new office in Dubai Marina yesterday to serve the increasing numbers of the Dutch community. Consul-General to Dubai Kees van Spronsen officiated over the inauguration ceremony at the 31st floor of Al Habtoor Business Tower. Sultan Bin Saeed Al Mansouri, Minister of Economy, and Bernard Wientjes, president of the Netherlands Association of Industry and Employers, graced the event. Consuls-general from other diplomatic missions and members of the business community also joined in the celebrations. The new consulate, which took more than nine years to be officially transferred from its previous office on Bank Street, addresses the growing need of the Dutch community, most of whom are involved in businesses, in Dubai. "We need a professional and efficient system of issuing visas so that members of our respective business communities can frequently meet each other in and on time," Van Spronsen said. The UAE is home to at least 4,500 Dutch nationals spread across all major industries such as banking, business, aviation, education and interior design. Some Dutch companies have opened businesses in free zones to enjoy freedom of establishment and to have more business opportunities in the emirate. "Our bilateral ties are embedded in a solid mutual understanding and respect for each other. "We are grateful for the smooth way doors are opened for us by Dubai government and the Dubai municipality. We would like to thank the leadership of Dubai for the ongoing support," Van Spronsen said. The Dutch economy is reliant on foreign trade and services as well as foreign investments. In 1980, The Dutch government opened a small consular mission in Dubai in 1980. 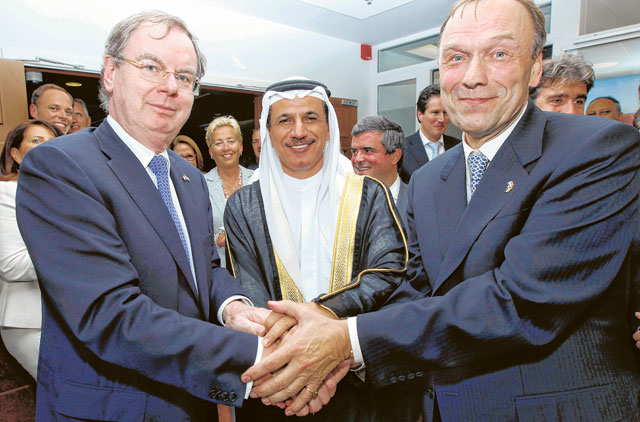 It then upgraded the mission into a consulate general in 2003 following the influx of Dutch nationals in the UAE.